Many years ago—in the good old days when Shimla and Manali were considered the ultimate in Himachal hill stations—my family, including a pre-teen me, was driving up to Kullu from Pathankot. We had been singularly unlucky since the start of the trip; the car (a sturdy Ambassador) had been hiccupping and belching smoke from almost the moment the road began climbing. Twilight came, all mist and deserted hillside, and our driver, an accomplished mechanic, finally gave up. A brief conference between my parents resulted in us deciding to stay at a small, dim town we had just passed. “Palampur," my father said. The town had been in the midst of a power cut when we had driven through, and was still dark when we trudged back. We managed to find rooms at the local rest house, and went to bed by candlelight. The next morning was what inspired me to return to Palampur 20 years later. We woke up, had a quiet breakfast in our rooms, and then walked out—to see rolling hillsides covered with tea gardens. 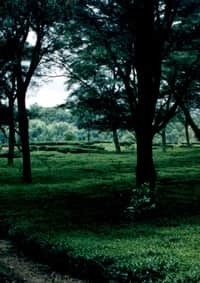 A dense green carpet, all neat furrows of what looked like a springy pile, marched all over the hills, broken here and there by slender trees with spreading canopies. A faint silvery mist still hung across it all, and the pine woods on the peaks beyond were shrouded in shifting cloud. I had just learned what serendipity meant. Two decades later, Palampur is no longer an obscure hill town frequented only by buyers of Kangra tea. The Tibetan community from nearby Dharamsala has branched out and built the serene hilltop monastery of Tashijong. The artists’ village of Andretta, once home to famous names such as Sobha Singh and Norah Richards, is a busy little place where you can watch superb pottery being made—and then buy that pottery as well. Baijnath, home to an ancient Shiv temple that bears an uncanny resemblance to the temples of Orissa, is flooded with pilgrims. And then, there are the tea gardens. 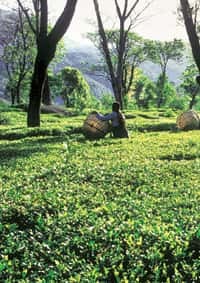 The pièce de résistance of Palampur is its tea. Darjeeling and Assam tea may be among India’s most famous teas, but Kangra chai is not to be sniffed at either. This is lovely, fragrant tea—a deep honey gold in colour, delicate and soothing, with perhaps (or is it just my imagination?) a whiff of the pine woods. If not the champagne of teas, at least a very good claret. Tea gardens spread out on the hillsides all around Palampur. Some are privately owned; some are “demonstration plots" managed by organizations such as the Council of Scientific and Industrial Research. And a vast estate, sweeping uphill in an impressive stretch near the road to Dharamsala, belongs to the Palampur Co-operative Tea Factory. As long as we didn’t pluck any leaves, we were welcome to stroll through the plantation, admiring the beauty of the tightly packed bushes, and gloating over a find—a small white tea flower, fragrant and lovely. From the tea gardens to the little shop outside the tea factory was a short trek, and a rewarding one. The rosy-cheeked lady at the counter was all smiles as she sold us five half-kilo jars of Kangra tea. “You must let it brew for at least three minutes," she said. “Milk and sugar separate." We agreed; Kangra tea deserves better than being boiled with pepper and cinnamon. The journey from the tea gardens to the shop, however, is actually a long and fascinating story. All the action takes place within the dark, aromatic interior of the tea factory. It took us a while to find the entrance—a rough rectangle cut into the corrugated aluminium sheeting eventually turned out to be the main door. A supervisor of sorts, discovering that we hoped to see the factory, deputed an elderly but spry worker to guide us. And take us around he did, keeping up a constant monologue on how tea is processed, how much it sells for, where to get the best Kangra tea. The tale, told in his half-garbled, toothless way as he scurried along, was amazing. Gnarled fingers sifted swiftly through tea leaves drying in wire-bottomed troughs, suspended above whirring fans. “Tips," he said, displaying a little bud of a tea leaf, along with its two just-opened lower leaves. “The best; it sells for Rs80 for 250g." The pair of leaves below the tip isn’t as fine, and commands a lower price: Rs60 for 250gm. All other leaves are lumped into an inferior category and used to make tea bags. Our guide marched us on, down to the crushers, where the leaves are chopped, and then into the fermenting room, where a blast of cool air ferments the leaves. From there, past the huge wood-fired ovens, where the leaves are “cooked" in steam, and then, the final analysis, to the grading room. The grading room was a tea- lover’s dream come true. Heaps of tea, a deep rich brown in colour, rose higher than our heads. The scent was intoxicating, so richly satisfying that we found ourselves yearning for a cup right then. But our guide had hurried on to the packaging room, from where Kangra tea is shipped to Kolkata, and then on to the rest of India and the world. At 400,000 to 500,000kg of tea a year—all of it harvested and processed between April and October every year—the Palampur Cooperative Tea Factory is a small enterprise. But the experience is in a class of its own. From the packaging room, it was a couple of steps to the road. A heartfelt thank you to our guide—who was already getting ready to return to his work—and then back to our car, with our booty from the shop. Five jars of tips, perfectly cured. A tea to be savoured. So fine that we ended up rationing it once we were back in New Delhi. And every time we brewed a cup, it took us back to Palampur, to memories of a tranquil and picturesque little town in Kangra. Flights: Air Deccan and Jagson Airlines operate flights between New Delhi and Dharamsala’s Gaggal Airport; Air Deccan also flies Pathankot-Gaggal. Expect to pay between Rs5,000 and Rs6,000 one way from New Delhi, between Rs200 and Rs300 from Pathankot. From Gaggal, hire a cab for the 37km trip to Palampur. Trains and road: From New Delhi, the Himachal Pradesh Tourism Development Corporation (HPTDC) operates a daily luxury Volvo bus to Dharamsala, from where you can get a cab (or a local bus, if you’re adventurous) to Palampur. Alternatively—and this is definitely more attractive—go to Pathankot by train, and then book on the Kangra Queen, a quaint hill train that chugs along a very scenic route uphill to Palampur. We stayed at what is by far the most elegant hotel in Palampur, the Taragarh Palace (book at the New Delhi office, Tel: 011-2464-3046, email: info@taragarh.com). Originally known as Al Hilal (which means ‘of the crescent moon’), Taragarh was built in the 1930s as a summer resort for the royal family of Kashmir, which still runs it as a property of the WelcomHeritage group. From the huge brass medallions to the silver teapots, everything is still emblazoned with the coat of arms of the royal family. Pine trees, tranquillity and lots of birds—including flamboyant yellow-billed blue magpies—make this the place to stay in Palampur. Tariffs range from Rs3,500 to Rs5,000 for a double room. Palampur doesn’t offer too much in the way of interesting cuisine. The town does have its fair share of dhabas, mediocre cafes and the like, but nothing you’d want to go out of your way to patronize. Taragarh’s very own dining room, with its huge windows and its stunning chandelier—all wine-red and crystal—was for us the best place to dine. They do breakfasts (Rs250 per person) and a daily buffet dinner and lunch, Rs400 per person per meal. A fairly good spread of decent Indian food, with a couple of nice Kashmiri dishes thrown in. At the top of the list are the many tea gardens in and around Palampur—especially those of the Palampur Cooperative Tea Factory, which welcomes visitors (not all tea estates do, so please do check before you step in). Other must-see attractions include the Tashijong Monastery, the Baijnath Temple and the artists’ colony at Andretta, all within about 20km of Palampur.